This book, the first full-length text on the subject, explores the everyday use of music listening while driving a car. It presents the relationship between cars and music in an effort to understand how music behaviour in the car can either enhance driver safety or place the driver at increased risk of accidents. A great deal of work has been done to investigate and reduce driver distraction and inattention, but this book is the first to focus on in-cabin aural backgrounds of music as a contributing factor to human error and traffic violations. Driving With Music begins by outlining the automobile, its relationship to society, and the juxtaposition of music with the automobile as a complete package. It then highlights concepts from the fields of music perception and cognition, and, within this framework, looks at the functional use of background music in our everyday lives. Driver music behaviours - both adaptive and maladaptive - are explored, with the focus on contradictions and ill-effects of in-car music listening. Professor Warren Brodsky is Director of Music Psychology in the Department of the Arts at Ben-Gurion University of the Negev (Beer-Sheva, Israel). After a short-lived career as a music performer, he completed an artist-degree (BMus) in orchestral Percussion, and majored in early childhood musical development leading to a Diploma and Certificate of Teaching (K-6) from the Rubin Academy of Music (Jerusalem, 1982). Warren trained as a music therapist at Hahnemann Medical University (Philadelphia, USA, 1984); during his 10 year clinical career he was registered (RMT), certified (CMT), and board-certified (MT-BC) in the USA, registered (RMTh) in the UK, and licensed as a Creative and Expressive Therapist in Israel. Warren completed his PhD in Psychology at Keele University (Staffordshire, UK, 1995) under the eminent music psychologist John A. Sloboda. At Ben-Gurion University of the Negev, Dr Brodsky served two 2-year Post-Doctorial Fellowships (1996-2000). Among his research initiatives and projects are: Handclapping Songs As A Spontaneous Platform For Cognitive Development; Mental Representations Of Musical Notation; Positive Aging Among Symphony Orchestra Musicians; Functional Application Of Music In Automobile Branding; and The Effects Of Music On Driver Behavior And Vehicular Control. "…a noteworthy step forward for research into a rich area for transport psychology and ergonomics. For audiophiles interested in transport research, I would recommend picking up this work as a thought-provoking collection of studies." 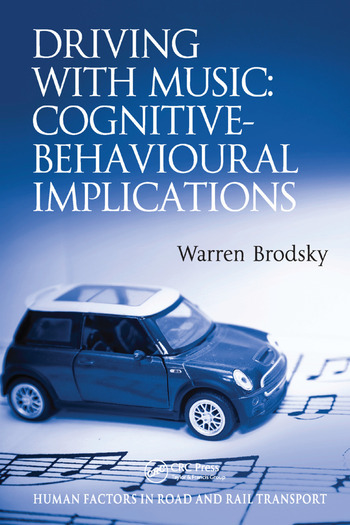 "With this book, Brodsky takes us through all aspects of driving while listening to music, in a very informative and interesting manner.By reading this book you will get a nuanced, detailed, informative picture of driving with music, both the positive and the negative sides of it, plus potential ways to bypass the negative effects of driving with music, and enhance the positive effects."